She Writes Press a Booksparks Imprint, 9781631524431, 264pp. Odessa, Odessa follows the families of two sons from a proud lineage of rabbis and cantors in a shtetl near Odessa in western Russia. It begins as Henya, wife of Rabbi Mendel Kolopsky, considers an unexpected pregnancy and the hardships ahead for the children she already has. Soon after the child is born, Cossacks ransack the Kolopskys' home, severely beating Mendel. In the aftermath, he tells Henya that, contrary to his brother Shimshon's belief that socialism is their ticket to escaping the region's brutal anti-Semitic pogroms, he still believes America holds the answer. Henya, meanwhile, understands that any future will be perilous: she now knows their baby daughter, who has slept through this night of melee, is surely deaf. 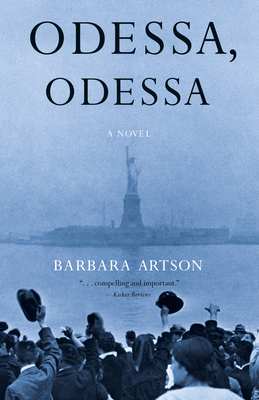 So begins a beautifully told story that unfolds over decades of the 20th century--a story in which two families, joined in tradition and parted during persecution, will remain bound by their fateful decision to leave Odessa.